One of those places where you can enjoy Asian cuisines, with a touch of fusion, locally is at Sasa Asian Cuisine inside Estancia Mall in Capitol Commons, Pasig City. Internationally-trained celebrity chef Raymar Reyes puts his extensive culinary experience to practice at Sasa Asian Cuisine, displaying a variety of classic and fusion dishes in Sasa's extensive menu. The delightful flavors of Asia come alive at Sasa, as each offering combines multiple Asian influences for a uniquely delicious and modern take on this flavorful cuisine. The restaurant's wall is marked murals of people from this continent and the ceiling is adorned with circular wood designs painted with various beautiful patterns. The colors of the furniture and decors are bright and lively giving customers a joyful and inviting feeling. Yasai Itame - are Japanese stir-fried veggies which is a common side dish in Japan. Chef Version is with fried lumpia wrappers, bonito flakes and Japanese mayo. I like this because it reminds me of one of my favorite Japanese dish which is the okomiyaki. This was very flavorful. 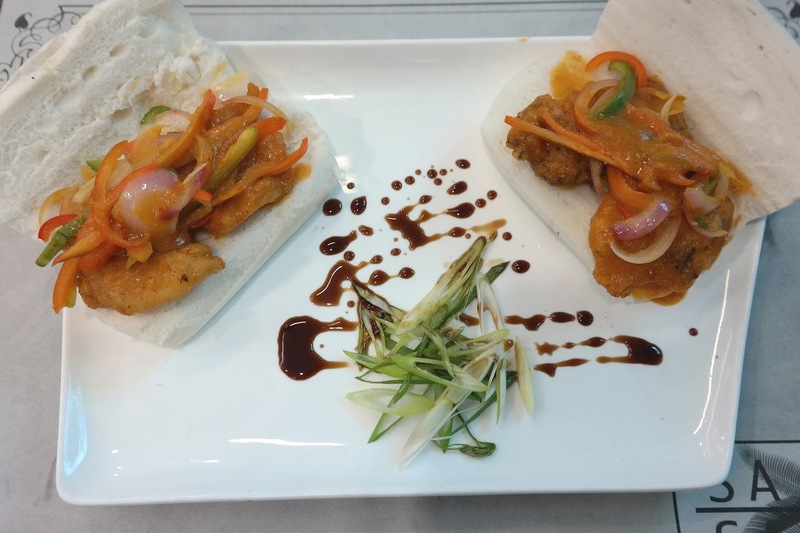 Cuapao Fish in Mantao Bun - sweet and spicy fish fillets in soft mantao bun. Perfect as appetizer. Cuapao Soy Pork in Mantao Bun - Cuapao is a folded steamed sweet buns with filling and is an authentic Chinese appetizer. This tasted savory, sour, sweet and nutty. Soy Chicken-Wrap Sa Chicken - Sasa's well-loved dish similar to Pecking duck but uses their signature soy chicken dish -- which slow cooked chicken simmered in Sasa's special soy-based sauce. So you basically put some of those chicken strips on the wraps, add some veggies and sauces, rolled, then either you put the whole thing in your mouth or enjoy by slowly taking small bites. Taiwanese Beef Noodles - Tender beef briskets with broth that is full of intense flavor, they may have added a bit of anise seed in there when simmered for up to 3 hours. It is worth the wait. The added veggies give this noodle dish additional texture and flavor as well. Chicken Karaage Burger - Japanese-style fried chicken that is fried to perfection with a crisp texture on the outside and super juicy and tender on the inside. I didn't get to try the fries that cane with it though. Shitake Miso Pork Roll - definitely the highlight of this foodie get-together! This is grilled rolled pork belly sans all the bony parts. This roll of belly fat is cooked for 4-6 hours. To make the lechon more tasteful it is rolled and grilled with shitake and miso. An order of this will include dips and sauces: apple miso, butter garlic, wasabi mayo, Sasa vinegar dressing. I personally love the butter garlic. You can also order this as a sisig and will be chopped to reasonable bits and topped with chopped pork liver, liver and mayo sauce, crushed crispy pork skin/fat otherwise known as chicharon. 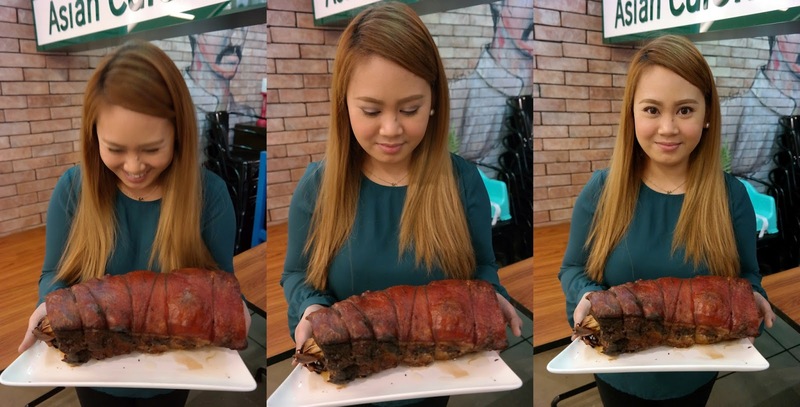 I LOOOOVVEEE both versions that I even took photos with the full lechon belly. I was gonna hold it dearly, you know, just how you would hold a delicate new born baby, but nah, I would be full of grease and I still had to go somewhere. LOL! Klepon - also known as onde-onde is a traditional Indonesian green-colored balls of rice cake filled with liquid palm sugar and coated in grated coconut. The palm sugar inside was so sweet but the rice cake greatly reminded me of our local version which is the "palitaw". Pandan Pouch - The sweetness of the palm sugar filling was somehow neutralized by the subtle flavor of the pandan crepe and the nuts gave it some texture. Thai Halo Halo - I find this just like our local halo-halo. But I am glad that the amount of the ingredients in here was not scrimpy. Mango Sago - a favorite mango dessert found in a lot of Asian countries. The mango puree was super yummy and the little Tapioca pearls were just perfect. Drinks - Tamarind, Pandan, Black Tea - all equally refreshing and perfect for the summer! Sasa dishes are affordable and come in sharing and group portions. Sasa’s ambience is perfect for entertaining large groups in a fun, comfortable setting, whether it be for long lunches with friends, intimate dinners with family, meetings or after work drinks with colleagues. Ongoing Promos also include Sasa Asian Bowls, Php 250 bowls available during weekdays that come with Soup and Unlimited Rice, Sasa Asian Days, free Asian Bowl for every Php 990 purchase on weekdays and Sasa Riddles - which gives each visitor a chance at free dessert or discount via a wheel of fortune, with every correct guess of an Asian-related riddle.